There’s nothing like a comforting bowl of vegetable soup to make your tummy and soul feel happy. 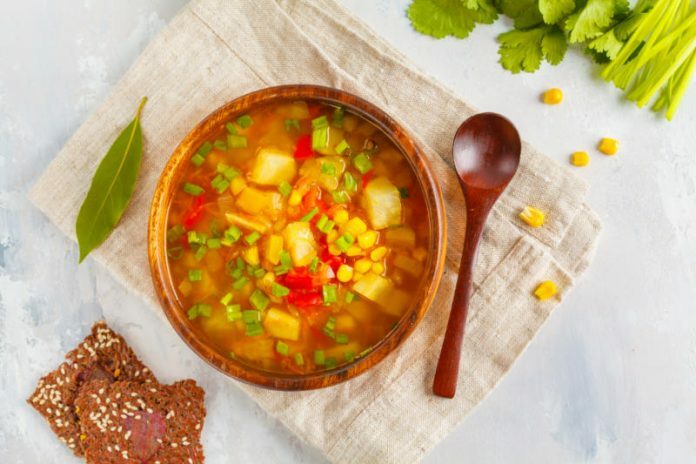 This vegetable soup recipe is filled with all kinds of vegetables, including carrots, celery, green beans, corn, and peas. Hearty soup recipes like this are the perfect way to get in a load of veggies in a tasty and satisfying way. This easy vegetable soup can be made any day of the week and can even be prepped in advance and frozen for later use. This vegetable soup recipe also requires very little effort to come together. You can use frozen, pre-cut veggies to make this a dump and stir sort of recipe. Even if you use fresh vegetables, there’s little preparation required. Feel free to add more of your favorite veggies to this soup as well. We sometimes like adding fresh baby spinach to this soup to turn it into something more akin to a minestrone soup recipe. To a large pot, add the olive oil and warm over medium-high heat. Add the onion, carrots, and celery. Reduce the heat to medium and sauté for 5 minutes. Add in the garlic and sauté for another 30 seconds, until the garlic is fragrant. Once the soup is boiling, add the green beans. Taste-test the soup for salt and add more if needed. Reduce the heat to medium-low and cover so that the soup is simmering rather than boiling; cook for 20 to 30 minutes, or until the potatoes are tender. Add in the corn and peas and cook the soup for another 5 minutes. Serve warm.